The Commitment to Development Index reminds the world that reducing poverty in developing countries is about far more than giving money. The CDI assigns points in seven policy areas: aid (both quantity as a share of income and quality), trade, finance, migration, environment, security, and technology. Within each component, a country receives points for policies and actions that support poor nations in their efforts to build prosperity, good government, and security. The seven components are averaged for a final score. 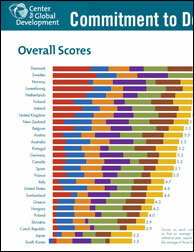 The scoring adjusts for size in order to discern how much countries are living up to their potential to help. To request hard copies of these materials for conferences or classroom use, contact Kristina Wilson. 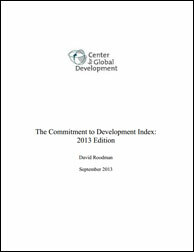 The Center for Global Development has compiled the Commitment to Development Index every year since 2003. It was published in Foreign Policy through 2006. Mapping Worlds made the data browsing tool. CGD staff members and outside collaborators designed and collect data for the seven individual components. CGD is solely responsible for the published design of the CDI. CGD Europe director and senior fellow Owen Barder directs the Index, building on the previous work of former CGD senior fellow David Roodman, who also designed the aid component and, in 2005, revised the trade component, building on the work of CGD senior fellow emeritus William Cline. Petra Krylova is the program coordinator. 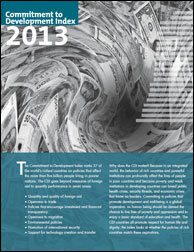 Data for the CDI is compiled from a variety of sources, including the OECD and OECD-DAC, the World Bank, UNHCR, UNFCCC, CEPII, IEA, and other organizations, along with inputs from academic researchers. When large, standardized data sets are not available for certain indicators, CGD and its collaborators collect and compile information country by country. All CDI data and code is available for download below in accordance with CGD’s data transparency policy, with the exception of data used to compute tariff measures—this uses the CEPII version of the MAcMap database, which is not yet publicly available. You can find most of the figures and tables in the Excel spreadsheets, but a few were generated in Stata. Both the Excel and Stata files contain queries to a SQL Server database, which is also available. Microsoft offers a free version of SQL Server, but it requires expertise to use. The aid component was influenced by an earlier paper by William Easterly. This paper elaborates on the private charity subcomponent. A 2007 paper by David Roodman adds the BRICs to the environment component to see how these countries stack up. The technology component was influenced by an earlier paper by Alicia Bannon and David Roodman.